Beer Bust: Yankees Rename 'Craft Beer' Stand At Stadium : The Two-Way Faced with criticism and ridicule, the New York Yankees have yanked a sign touting a "Craft Beer Destination" stand at their stadium, after beer fans noted that all the products are from MillerCoors. At other ballparks, genuine craft beer is easy to find. The New York Yankees' "Craft Beer Destination" met with derision online, after fans noted the beers were all MillerCoors products — and one of them is a cider. The stand now has a new title, the "Beer Mixology Destination." The baseball season is still young, but the New York Yankees have already faced harsh public criticism. No, we're not referring to their lackluster record. 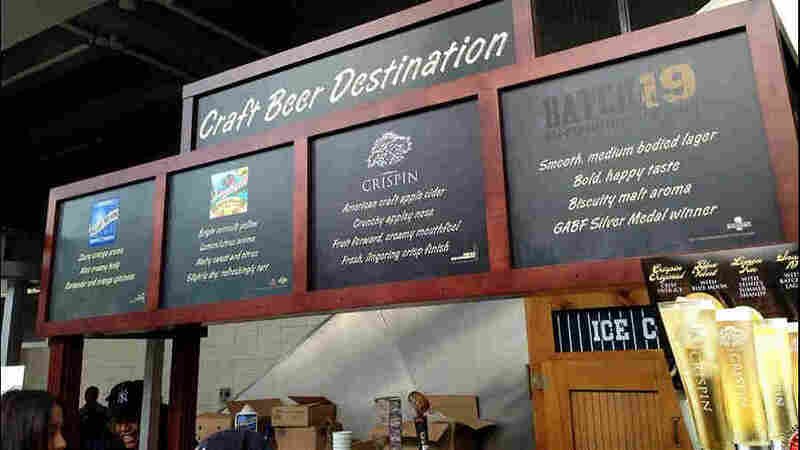 Instead, the Yanks were accused of trying to hoodwink beer drinkers with a new "Craft Beer Destination" concession stand at their Bronx stadium. The problem arose when writer Amanda Rykoff spotted the stand's sign, with an arty chalkboard effect imparting the sense of a brewpub. A fan might expect it to sell beers from New York's famed Brooklyn Brewery, or perhaps Brewery Ommegang, located in the baseball mecca of Cooperstown. Instead, all of the offerings — Blue Moon; Leinenkugel's Summer Shandy; Crispin; Batch 19 — exist under the MillerCoors corporate umbrella. None of them have a special tie to New York. As many critics noted, Crispin is a cider, not a beer. And its roots are in Minneapolis, home of the Yankee-hating Twins. Many news outlets including Deadspin took up the story, noting that as part of a conglomerate, the MillerCoors products don't meet the traditional definition of "craft" as established by the Brewers Association, which requires small production and independent ownership. We should note that in spotting the "crafty" ruse at Yankee Stadium, Rykoff didn't besmirch the beers. "I confess that on a hot summer day, I will enjoy a Summer Shandy on occasion, and Blue Moon is certainly a popular beer," she wrote. "But to call them 'craft beers' is nonsense and insulting. Real beer drinkers know better but countless numbers of fans will gladly shell out $12 for an overrated beer being marketed as a specialty brew." Rykoff concluded, "Once again, the Yankees have figured out yet another way to charge a superior price for an inferior product." The team has now changed its approach, keeping the stand but renaming it the "Beer Mixology Destination." That's the word from Amanda Rykoff, who announced what she called "breaking beer news" on Twitter Saturday. Other than seeming to be a brazen attempt to glom onto yet another trend — and risking the wrath of cocktail enthusiasts — the new name hints at the concoctions that result from combining Crispin cider with its three stand-mates. The Yankees are not alone in trying to tap into the growing craft beer market. Craft beer has made inroads at many Major League Baseball stadiums, as fans seek a brew with more flavor — and perhaps a bit more kick, to cut down on trips to the concession stand (and other facilities). In Detroit, at least seven Michigan craft brewers, including Bell's, Founders, and New Holland, have their beers on tap at Comerica Park, as Darren Rovell writes at ESPN. And in Baltimore, Orioles fans can easily find beers from Maryland and Delaware, Heavy Seas, Dogfish Head, and Evolution among them, as well as Flying Dog, which is tapping special cask-conditioned brews on Fridays. The Camden Yards property also has a brewpub that's open all year. And while San Diego fans have suffered through a 2-9 start this season, they can console themselves with a selection of craft beers that's among the best in the majors, befitting the city's bustling beer scene. The Petco Park Insider says the "star lineup" of brewers includes Stone, Green Flash, and Karl Strauss. The park also sells beer from Sierra Nevada, Ballast Point, and others. We should note that San Diego also has Bud Black at its stadium. But that's not an Anheuser-Busch product; it's the name of the Padres' manager.